A cyclist was hurt when he was hit by a truck driver in front of the Port Authority Bus Terminal — in the three-block portion of Eighth Avenue where the protected bike lane disappears to accommodate cabs, a witness and police said. 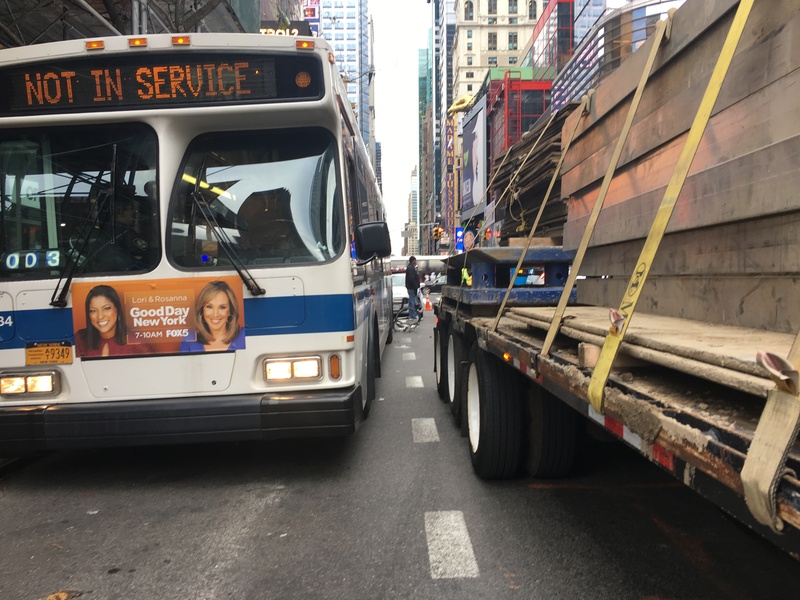 It is unclear how seriously the bike rider was hurt, but a witness said he was struck by the truck as he maneuvered around a stopped bus and into traffic — a move necessitated because the protected bike lane on northbound Eighth Avenue abruptly ends at 39th Street and begins again at 42nd Street. Another view of the crash. The witness said the cyclist was being treated at the scene. The area is in desperate need of traffic calming, wider sidewalks for pedestrians and better bike infrastructure. Only got bumped a couple of times. Think about that, New York City Department of Transportation. The Manhattan avenue bike lanes are approaching the 10 year anniversary of their opening and still aren’t finished. This isn’t a Vision Zero approach to cycling and it certainly isn’t going to lead to cycling being a widely used mode of transportation in New York. There’s no excuse for failing to close this gap. Riding though here is terrifying, even after the 100th time. More people are going to get hurt. I am so not surprised. But let’s get serious and make specific suggestions on what we would like to see there. A parking-protected bike lane inbetween a cab stand and PABT will not be worth a hill of beans. But we can’t just throw up our hands either. We need to get more creative. I’d rather idle slowly through here for a block than deal with what’s there today. I’m more worried about people just walking in other blocks of bike lane. Perhaps one way to address this might be to provide a more orderly cab pickup line with barriers to crossing the bike lane except at one or two places. Viaduct for the 3 blocks in question? Looking at it with Google Earth I can’t think of anything else which would work here. You can in theory put the protected lane on the other side of 8th Avenue but that means crossing over and back again, with the attendant delays. Most cyclists would just not bother crossing over. So that leaves either the status quo or a viaduct. The advantage of the latter is it can go over 42nd Street, thus avoiding a busy, delay-causing intersection in the process. Or ban cars from within 3 blocks of PABT, replace the cab stand with a block of CitiBikes, and everyone will get where they’re going faster. 8th Ave is already split with a barrier: cabs to the left, traffic to the right. Put a Jersey Barrier 8ft to the right of the current barrier, and that becomes your protected bike lane. Use split phase signals to move the bike lane from the far-left, to the middle, and back to the far-left. On the split-phase signal, show a “yellow bike” when it’s the cars’ turn, so that experienced cyclists can proceed without risking a ticket. You would think security would demand this. Why not move the cab stand to the side streets? No.. in security-land, cars are only a minor threat; but anyone on a bike could be carrying a ton of TNT (hidden, of course). The few times I’ve ridden through here were pretty bad, although the gridlock makes it a tiny bit less harrowing. If I ever have to come through again, I think I’d rather get on the sidewalk and walk my bike a few blocks. There were, last year, still faint traces of a bike lane marking to the right of the dividers. Not that anyone in their right mind would assume it was safe–if you’re stuck on 8th Ave. by the PABT use the cab lanes. Most of them are stopped and the pedestrians are a problem, but there are no 18-wheelers. Go slow, you’ll get through. Every time I ride through this block I get honked at and aggressively tailgated by psychotic drivers who cannot cope with the fact that a cyclist is in the middle of the road and not “over to the side where you belong.” They even do it when we’re approaching a red light. Their immature sub-100-IQ rage against cyclists is so acute that they can’t even deal with a cyclist reaching a red light before them. Sadly, the way the city is currently being run, it will take someone actually being killed there to fix this. Close and raze the PABT. Extend the 7 line to Secaucus and the C over the GWB to Fort Lee. Build an infinitely smaller Greyhound/Megabus terminal on 11th Avenue. Admittedly fixing the bike lanes on 8th avenue is not the most pressing reason to do any of that. Where you need protection the most, the city is out to lunch. Good luck, you’re on your own!